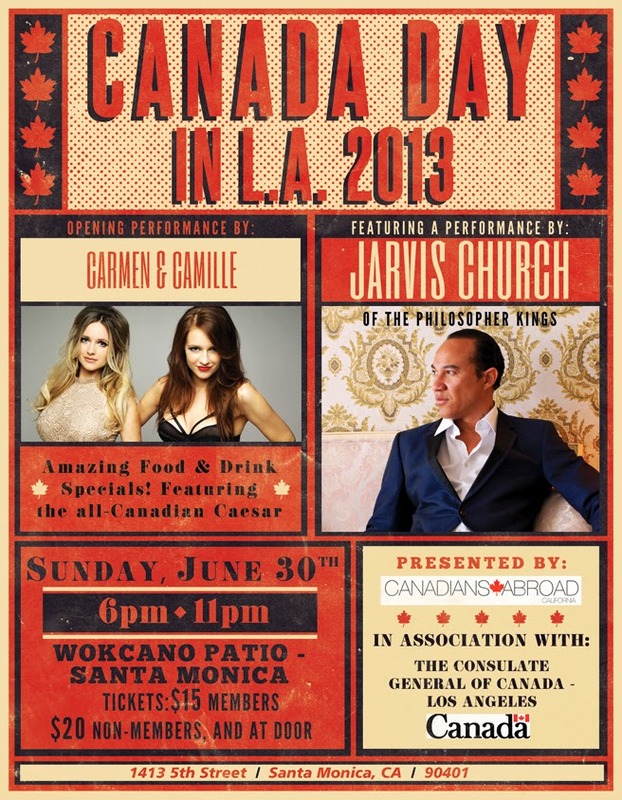 Laura Vandervoort will be a guest at the Canada Day in LA 2013, Sunday June 30th at posh Santa Monica restaurant/lounge, Wokcano. 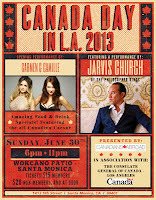 LOS ANGELES, June 24, 2013 /PRNewswire/ -- Sunday June 30th, Canadians in LA (and Angelenos who are Canadian at heart) can celebrate Canada's 146th birthday at posh Santa Monica restaurant/lounge, Wokcano. The rooftop lounge will feature performances by renowned Canadian soul-singer, producer and front-man for the Philosopher Kings, Jarvis Church and Juno-nominated pop sensations, Carmen and Camille. "One of my favorite things about living in LA is meeting other Canadians," said Jarvis Church about the upcoming performance. "There's a million of us here and every time it's a lovefest." Alan Thicke, Honorary Chair of Canadians Abroad says, "I'm always proud to be identified by my Canadian-ness in Los Angeles. They like us. We're good. And fun. And we remain in close contact with one another so we can exchange Justin Bieber gossip, brag about Ryan Gosling and astronauts." Guests will get their maple leaf flags flying with great Canadian-themed food and drink specials including Canadian import beer, Molson, at $5, and Canadian signature cocktail, the Caesar. There will be a star-studded, red carpet entry where guests will pose for the camera, including Canadian Hollywood celebrities such as Jodi Balfour, Brandon Jay McLaren, Laura Vandervoort, and Ricky Mabe, as well as comedienne Debra DiGiovanni, and Luc Robitaille of the LA Kings. Canadian Comedy Awards producer Tim Progosh, will be on hand doing red carpet interviews for the soon to be Canadian Comedy hall of fame. Canadians Abroad is the largest Canadian expat organization in the world, based in Southern California, where there are over 400,000 Canadians. Formed in 1998 by a group of enthusiastic Canadian expats with the support of former Prime Minister Kim Campbell. Dedicated to connecting Canadians and Americans in Southern California for social and professional networking".